The 2014 Chevy Silverado is no exception. The redesign was brand new just a year prior, with an even tougher look and platform. Captain America even “borrowed” one in The Winter Soldier. GM’s 5.3 liter L83 V8 sits under the hood, pumping out 355 hp and 383 lb-ft of torque, all a very usable package, appealing to a sensible, reserved customer base. But why be sensible? You have a big fat Detroit V8 under that hood! Let’s see how that mill can perform with just a few simple power mods. This generation came around in the middle of 2013, so if you have a 2013 or newer, 2014 Chevy Silverado modifications will probably work for you, too. But manufacturers’ codes have a specific issue: they’re tailored to fit a broad range of people. You’re not a broad range of people. You’re just you, and you have your own preferences. You might want a little more power. You might want a little more efficiency. You might want to run 87 Octane. With a visual interface and lightning-quick reflashes, Diablosport lets your do all of this with a single unit. The Trinity is Diablo’s flagship. It features digital gauges, real time information, and a huge color touch screen. More compact and at a more compact price point as well, the DiabloSport I-1000 Intune offers a quick and easy way to reflash your ECU, as well as a diagnostic code reader. Now for the fun part: Either of these systems will unlock an estimated 20 horsepower and 25 lb-ft of torque. If you’re new to tuning, that’s massive. Engine designers will spend years trying to get their engines to crank out those kinds of figures. In the old days, carburetor tuning would take ages. Now it’s just a few buttons. These tuners also offer an 87 octane tune, which boosts hp by 13 and torque by 18; and an economy mode, which you can set if you’re about to take a long trip on the highway. There are a million more features, too, so head over to Diablosport.com and plug in your truck’s info to read all about it. So the tuners have the fuel all taken care of. What about air? All that fuel will go unburned if there’s not enough air coming in to mix it with. That’s where a cold air intake comes in. Like they did with your fuel maps, the GM people had to compromise with your intake. It had to be powerful, but quiet. Thankfully, you don’t care about it being quiet. In fact, you could use a little more ruckus in your life. An aftermarket cold air intake can allow a better flow into your engine, which means colder air and more of it. Cold air is denser than hot air, packing more burnable content when mixed with fuel. You have two main choices for a cold air intake: K&N and AFE. Both are great companies that have been around forever, dyno-test every intake they design, and offer massive warranties. 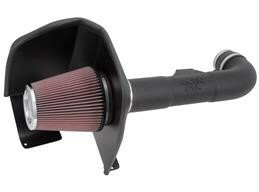 K&N reports that their intake can add up to 10.68 hp to the 2014 Silverado 5.3. AFE…umm…they haven’t reported numbers for their Magnum Force Stage 2 Pro5R unit, though the physics are the same. We’ll leave this one up to you. Intakes are easy to install, too. Here’s a five minute video on the K&N installation. It’s important to note that K&N’s dyno test was likely performed with a stock Silverado – it had not yet been tuned with a power programmer. So if the programmer added 20 hp and you’re running 375 total, the K&N won’t necessarily take you up to 385. However, as mentioned before, that programmer will require more air, so an intake will be a great supporting mod. Now we come to the other end. Just as air has to enter the engine, exhaust has to leave it. And, just as the factory made your intake nice and quiet for all the boring drivers on the road who would rather listen to Taylor Swift singing about a year she doesn’t remember than awesome engine noises, they’ve muffled your exhaust, as well. And as you might suspect, that reduces flow. The more exhaust flow your engine can get, the better, so open up that exhaust and let it breathe. We should note an exception to this rule, however. Many modern engines are designed to make use of backpressure for maximum efficiency. This is generally a greater factor in smaller engines, but it’s a great reason to opt for a professionally designed exhaust system rather than just welding up some straight pipe you bought at the hardware store. Another reason is sound. We all love a great exhaust note. We’re all dissatisfied with the vast majority of stock exhaust sounds. But an exhaust soundwave, if it bounces back on itself within the cabin, can cause drone, and that can be extremely distracting (and annoying) for the driver. Instead, you can get a scientifically designed sound that you’ll love. We have a pretty vast selection of exhausts for the 2014 Silverado, but we’ll just focus on the famous Flowmaster American Thunder cat-back system, a single muffler, dual exit setup with a killer sound. According to Flowmaster’s dyno chart, it can recover 20 horsepower and about 25 lb-ft or torque from your stock engine. Again, those figures were measured against a stock truck, so don’t expect to stack another 20 horsepower on top of the already improved numbers. 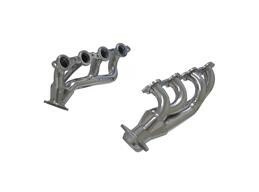 The great thing about bolting up a Flowmaster cat-back exhaust is that it will fit right in with your Flowmaster Scavenger headers, another way to grab more power from the engine. We started with a stock 2014 Chevy Silverado LT with an unmodified 5.3 liter V8 engine. First we added a Diablosport power programmer to tell the computer how to make a real truck behave as it should, gaining 20 hp and 25 ft-lbs of torque. Next we added an AFE or K&N cold air intake, the latter of which is worth nearly 11 more horsepower on an unmodified Silverado. Finally, we cleared the path of exhaust with a Flowmaster American Thunder exhaust system and a pair of Flowmaster Scavenger headers to make sure the truck is making all the power it can. What kind of power will all four mods make together? You’ll have to dyno yours and let us know, but we’d make an educated guess of around 385 hp, give or take. And these are all parts you can just bolt on. They’re all easy to install. With our massive power gains in place, it’s almost time to start modding the rest of the truck to keep up. Join us on Wednesday as we investigate how to improve handling, brakes, and suspension with AutoMods, and our next adventure in 2014 Chevy Silverado parts. As always, you can find a huge selection of 2014 Chevy Silverado parts and accessories right over at StreetsideAuto.com. Do you have a suggestion for what vehicle we should virtually mod next? What about your own project? Send us your suggestion, and if we pick it, we’ll send you a $100 StreetsideAuto.com gift card to get the ball rolling. Winners will be selected on the last Friday of every month. Want to make even more scratch? Create a quick installation guide for a product you’ve already bought from us and you could win a $100 SSA gift card! Dunno if you boys have done this yet but I’d like to see a Focus ST done. I have a ’14 and really enjoy it (although winter has kept it off the road and it only has 319 miles, kind of a bummer). I have a few mods I’m looking to do soon, and it’d be interesting to see what you guys would do with one with the stuff you have. Maybe 2011 Mustang or 1973 Gran Torino for the next car? Mod an ’04-06 GTO please. Their prices are more than affordable, and they respond VERY well to mods. I’d like to see a base v6 Cadillac CTS get some love. Kind of curious what if anything you guys can do to one of those. You guys should really think about doing a 2nd Gen (1970 – 1981) Trans Am! The collectability of these cars is just starting to sky rocket and as such the aftermarket is starting to take off too. There’s so much you can do to these cars suspension wise and you can easily swap in any chevy/gm engine/transmission (I know, I’ve done it).